Cultivating good character is an important part of a child's education at home, at school and in the community. Many UPF chapters offer lessons in classrooms or train teachers and administrators in character education or peace education. 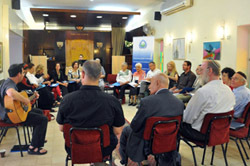 UPF organizes programs that help build understanding, respect and cooperation among people of different faiths. Consultations take place among scholars, diplomats, government officials, civil society representatives and religious leaders. The Middle East Peace Initiative has been promoting peace since 2003 through dialogue, people-to-people diplomacy, fact-finding trips, interfaith pilgrimages and conferences. It brings religious leaders, parliamentarians, academicians, women leaders, youth and civil society representatives together in Israel, Palestinian Territories and Jordan. 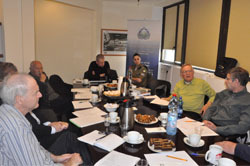 Forums explore Track II approaches to the crisis in Syria. Read UPF's Statement about Middle East Peace. On the Korean Peninsula following World War II, people with a common history, culture, and language were divided by the Cold War struggle between superpowers. UPF conferences and forums bring together leading diplomats and scholars to offer insights into prospects for improved relations among the countries of the region. Political, military, economic, and civil-society factors are considered at conferences and forums. Civil-society initiatives between South Korea and North Korea include tourism, humanitarian projects, and various forms of personal engagement. Scroll down for reports. The situation in the South Caucasus, especially after the war between Russia and Georgia in 2008, threatens international security and causes suffering. UPF's South Caucasus Peace Initiative addresses ideological, interreligious and humanitarian challenges in Armenia, Azerbaijan and Georgia. Scroll down for reports. When the former communist nation of Yugoslavia broke up in the early 1990s, few could have envisioned the scope of ethnic and religious conflict that would visit the region with such ferocity. Two decades later, there is general stability in the region; yet, tensions among some nations and ethnic groups remain high. Scroll down for reports. Goal: Resolve historical conflicts among peoples and nations in the Balkans region, with particular focus on Albania, Kosovo and Macedonia. Method: Consultations among political, social, and religious leaders in the region as well as from the wider European community to consider paths to peace in the Balkans. Estonia, Latvia and Lithuania consider their history under the Soviet Union between World War II and 1991 as a time of occupation. Yet their common history with Russia goes back centuries, and their economic future is inevitably linked with their powerful neighbor to the East. With important Russian-speaking communities in their midst, the Baltic nations are faced with the challenge of keeping their own identity while maintaining positive relations with their neighbors. At the same time, since they are integrated into the European Union, they can play a mediating role between Russia and Europe. Scroll down for reports. UPF supports UN Security Council Resolution 1325, which calls for increasing involvement of women in preventing and resolving conflicts, peace negotiations, peacebuilding, and post-conflict reconstruction. Furthermore, the majority of the poor people of the world are women and children, and global poverty cannot be solved without the empowerment of women and the leadership of women. Scroll down for reports. Building a culture of peace is the most effective way to prevent conflict, violence, and poverty, and a family culture of heart is the wellspring of a culture of peace. UPF promotes this through World Peace Blessings. Scroll down for reports. Method: In World Peace Blessing ceremonies, newlyweds and couples renewing their vows make a sacred promise as husband and wife to love each other faithfully, live together in peace, and raise up their children and grandchildren to uphold purity and fidelity. A special contribution to world peace is made by couples who bridge the divides of race and religion. 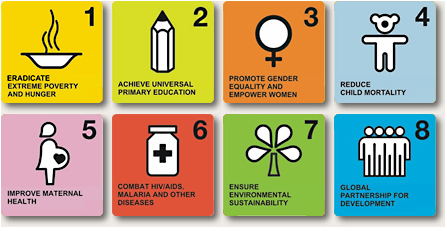 The UN General Assembly adopted eight Millennium Development Goals (MDGs) in 2000 to be achieved by 2015. Progress to date has saved lives, ensured that children attend school, reduced maternal deaths, expanded opportunities for women, increased access to clean water, and freed many people from disease. Each year on September 21, the UN invites all nations and people to honor a cessation of hostilities and commemorate the International Day of Peace through education and public awareness on issues related to peace. In the quest for peace, UPF and its Ambassadors for Peace around the world organize commemorations of the International Day of Peace each year. "The Right to Peace - The Universal Declaration of Human Rights at 70." "Partnerships for Peace - Dignity for All." The theme for 2014 was "The Right of Peoples to Peace," marking the 30th anniversary of the UN General Assembly Declaration on the Right of Peoples to Peace. See UPF's Statement on the International Day of Peace 2014. For a PowerPoint overview of UPF observances click here. The United Nations set the theme for this year's observance as "Education for Peace." For a PowerPoint overview of UPF observances, click here. The United Nations set the theme for this year's observance as "Sustainable Peace for a Sustainable Future." For a PowerPoint overview of UPF observances, click here. The theme chosen by the UN for 2011 was "Peace and Democracy: Make Your Voice Heard." For a PowerPoint overview of UPF observances, click here. The International Day of Peace 2010 focused on youth and development, under the slogan: "Peace = Future." UN Secretary-General Ban Ki-moon called on youth everywhere to "Expand on your work to build peace. Share your plans and ideas, with creativity and passion. The world's concerns will soon be in your hands." For a PowerPoint overview of UPF observances, click here. The theme chosen by the UN for 2009 was "Disarmament and Non-proliferation." For a PowerPoint overview of UPF observances, click here. The UN's theme for the International Day of Peace in 2008 was "Human Rights and Peacekeeping." For a PowerPoint overview of UPF observances, click here. This age of globalization needs enlightened people in each faith who can examine their sacred writings and traditions and identify the aspects that can benefit all humanity as well as those that preserve each religion's identity. The UN designated the first week of February every year as World Interfaith Harmony Week with the motto of "Love of God and Love of the Neighbor" / "Love of the Good and Love of the Neighbor." UPF calls on people of faith to honor the Divine indwelling in a way that encourages understanding, respect, and cooperation among people of all faiths for the well-being of our communities and peace in the world. For a PowerPoint overview of UPF observances, click here. 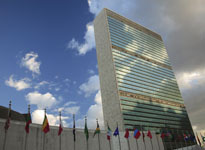 A World Interfaith Harmony Week observance took place February 7, 2012 in the UN General Assembly Hall on the theme "Common Ground for the Common Good." The President of the 66th Session of the General Assembly, H.E. Mr. Nassir Abdulaziz Al-Nasser, said in announcing the event: "In our conflict-ridden world, I believe it is important to recognize the historical good done by people of all faiths in many of the areas of the work of the United Nations as well as the current successful partnerships in various parts of the world between UN agencies and religious groups particularly in meeting the humanitarian needs of disaster-stricken people." For a PowerPoint overview of UPF observances, click here. The first week of February every year was designated World Interfaith Harmony Week by an October 20, 2010 resolution of the United Nations General Assembly at the initiative of King Abdullah II of Jordan. Its motto is "Love of God and Love of the Neighbor" / "Love of the Good and Love of the Neighbor." For a PowerPoint overview of UPF observances, click here. The International Day of Families, May 15, is celebrated at the United Nations headquarters and around the world. The Universal Peace Federation joins in commemorating this day because it considers the family as a microcosm of the global community and because sustainable peace is grounded in the family as the most intimate social unit, the school of love. The UN International Day of Families is celebrated each May at the United Nations headquarters and around the world. The Universal Peace Federation joins in commemorating this day because it considers the family as a microcosm of the global community and because sustainable peace is grounded in the family as the most intimate social unit, the school of love. For 2018, the UN chose the theme "Families and inclusive societies." The UN International Day of Families is celebrated each May at the United Nations headquarters and around the world. The Universal Peace Federation joins in commemorating this day because it considers the family as a microcosm of the global community and because sustainable peace is grounded in the family as the most intimate social unit, the school of love. For 2017, the UN chose the theme "Families, education and well-being." The UN International Day of Families is celebrated each May at the United Nations headquarters and around the world. The Universal Peace Federation joins in commemorating this day because it considers the family as a microcosm of the global community and because sustainable peace is grounded in the family as the most intimate social unit, the school of love. For 2016, the UN chose the theme "Families, Healthy Lives and Sustainable Future." The UN International Day of Families is celebrated each May at the United Nations headquarters and around the world. The Universal Peace Federation joins in commemorating this day because it considers the family as a microcosm of the global community and because sustainable peace is grounded in the family as the most intimate social unit, the school of love. For 2015, the UN chose the theme "Men in Charge? Gender Equality and Children's Rights in Contemporary Families." The UN International Day of Families is celebrated each May at the United Nations headquarters and around the world. The Universal Peace Federation joins in commemorating this day because it considers the family as a microcosm of the global community and because sustainable peace is grounded in the family as the most intimate social unit, the school of love. For 2014, the UN chose the theme "Families Matter for the Achievement of Development Goals" and noted that 2014 is the 20th anniversary of the International Year of the Family. For a PowerPoint overview of UPF observances, click here. The UN International Day of Families is celebrated each May at the United Nations headquarters and around the world. The Universal Peace Federation joins in commemorating this day because it considers the family as a microcosm of the global community and because sustainable peace is grounded in the family as the most intimate social unit, the school of love. 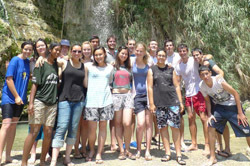 The theme of the 2013 observance was "Advancing Social Integration and Intergenerational Solidarity." For a PowerPoint overview of UPF observances, click here. The UN International Day of Families is celebrated each May at the United Nations headquarters and around the world. The Universal Peace Federation joins in commemorating this day because it considers the family as a microcosm of the global community and because sustainable peace is grounded in the family as the most intimate social unit, the school of love. The theme of the 2010 observance was "The Impact of Migration on Families." For a PowerPoint overview of UPF observances, click here. The UN International Day of Families is celebrated each May at the United Nations headquarters and around the world. The Universal Peace Federation joins in commemorating this day because it considers the family as a microcosm of the global community and because sustainable peace is grounded in the family as the most intimate social unit, the school of love. The theme of the 2009 observance was "Mothers and Families." For a PowerPoint overview of UPF observances, click here. The Global Day of Parents is observed on June 1 every year. The day was proclaimed by the UN General Assembly in 2012 with resolution A/RES/66/292 and honors parents throughout the world. It provides an opportunity to appreciate parents for their selfless commitment to children and their lifelong sacrifice towards nurturing this relationship. In its resolution, the General Assembly also noted that the family has the primary responsibility for the nurturing and protection of children and that children, for the full and harmonious development of their personality, should grow up in a family environment and in an atmosphere of happiness, love and understanding. International Women's Day (March 8) commemorations bring together women leaders to learn from each other about building peace at home, in the community, nationally, and globally. For a PowerPoint overview of observances, click here. The theme chosen by the UN for 2015 was "Empowering Women - Empowering Humanity: Picture It!" Read UPF's Statement on International Women's Day. The theme chosen by the UN for 2016 was "Planet 50-50 by 2030: Step It Up for Gender Equality" Read UPF's Statement on International Women's Day. The theme chosen by the UN for 2017 was "Women in the Changing World of Work: Planet 50-50 by 2030"
The theme chosen by the UN for 2018 was "Time is Now: Rural and urban activists transforming women’s lives"
To cultivate the spirit of one family under God, UPF offers disaster relief and organizes service projects such as caring for public spaces, supporting access to education, promoting good health, and providing medical supplies. UPF conferences convene professionals and stakeholders from a wide range of sectors—government, religion, academia, civil society, the media, the arts, etc.—encouraging interdisciplinary and multi-sectoral dialogue aimed at the search for solutions to the world's critical problems. UPF conferences underscore the importance of spiritual values, ethical principles, teamwork, responsible leadership and good governance. The “International Association of Parliamentarians for Peace” has been launched as a worldwide association of parliamentarians which provides a forum to bring their experience and wisdom to bear in the search for solutions to our world’s problems.